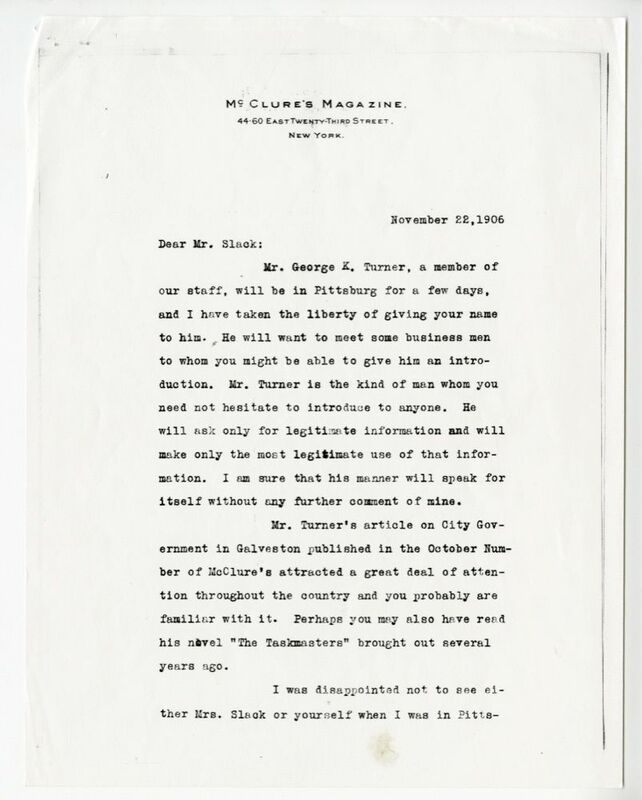 Mr. George K. Turner4, a member of our staff, will be in Pittsburg5 for a few days, and I have taken the liberty of giving your name to him. He will want to meet some business men to whom you might be able to give him an introduction. Mr. Turner is the kind of man whom you need not hesitate to introduce to anyone. He will ask only for legitimate information and will make only the most legitimate use of that information. I am sure that his manner will speak for itself without any further comment of mine. Mr. Turner's article6 on City Government in Galveston7 published in the October Number of McClure's3 attracted a great deal of attention throughout the country and you probably are familiar with it. Perhaps you may also have read his novel "The Taskmasters"8 brought out several years ago. I was disappointed not to see either Mrs. Slack9 or yourself when I was in10 Pitts- #2burg. In fact, I saw very few people. I was very tired and greatly in need of a rest when I arrived there and my old pupils11 came to see me in such large and frequent flocks that I spent the time between their calls largely in recuperating. I shall be in town again, however, before the winter is over and then I shall certainly see you. Faithfully yours, Willa Sibert Cather Mr. John C. Slack, Fidelity Title & Trust Co., Fourth Ave., Pittsburg, Pa. Contains two leaves, with typewriting on the recto. According to the Geographic Chronology, Cather was in New York during the month of November. Cather was in Pittsburgh from roughly October 12 to November 1, 1906. From Allegheny High School, where Cather taught before taking a job at McClure's Magazine in the spring of 1906. Slack, John Clemson (1855-1939). Pittsburgh attorney and insurance executive. Born in Alleghany City, PA, John Slack was admitted to the bar in 1879. From 1889 to 1903, he was title officer of the Fidelity Title and Trust Company in Pittsburgh, PA. He and his wife Margaret Hall Slack had two children of their own and also raised four nieces in their home. Willa Cather knew Slack during her Pittsburgh years; Slack knew Isabelle McClung and was a neighbor of Ethelbert Nevin. 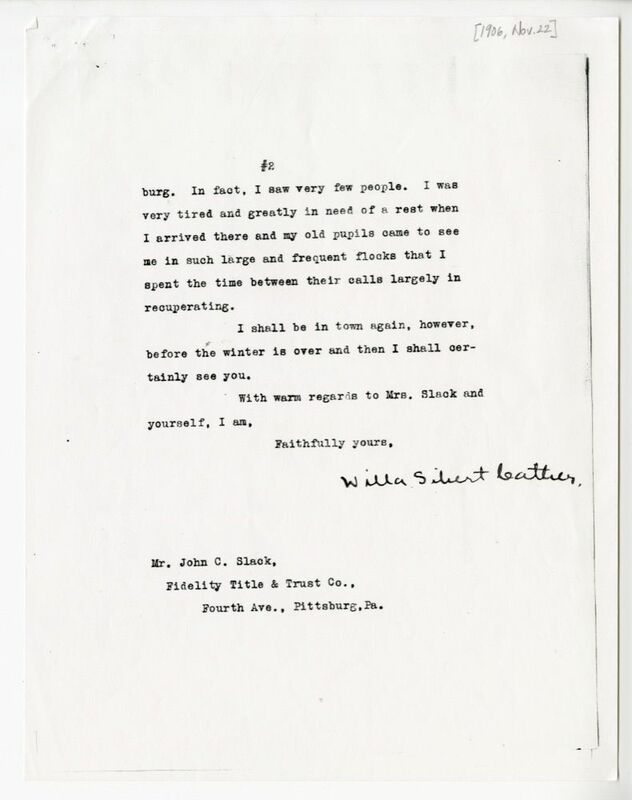 Cather wrote him frequently during her 1900 extended visit to Washington, DC. She also wrote him on McClure’s Magazine business in 1906, and he called on her at the McClure’s office in 1907. From 1903 until his death in Edgeworth, PA, he was president and general counsel of Union Fidelity Title Insurance Company of Pittsburgh. Turner, George Kibbe (1869-1952) American journalist and author. Born in Quincy, IL, George Kibbe Turner graduated from Williams College in Williamstown, MA, in 1890 and was hired as a reporter for the Springfield Republican. While working as a reporter, he began publishing short stories in national magazines, including McClure’s Magazine. In the wake of the 1906 departure of Lincoln Steffens, Ray Stannard Baker, and Ida Tarbell from McClure’s, S. S. McClure hired Turner as a staff writer; Cather was hired as a member of the editorial staff at about the same time. Turner wrote a number of muckraking exposés typical of McClure’s, including on gambling and prostitution in Chicago, IL, and on Tammany’s control of criminal organizations in New York City. He left McClure’s in 1913 to focus on writing fiction and film scripts. Slack, Margaret E. Hall (1857-1918). American amateur musician. Born in Pittsburgh, PA, Margaret Hall was the daughter of John W. Hall and Margaret Ewing Hall. She studied the piano in preparation for a concert career, which she gave up when she married attorney and banker John C. Slack in 1882. Of their four children, two survived to adulthood; the Slacks also took four nieces into their family. The family home in Allegheny was adjacent to that of the Nevin family; Cather probably met Ethelbert Nevin through Margaret Slack, who gave many musicales. Cather’s story “Uncle Valentine” (1925) was partly based on her memories of this time, and Margaret Slack has many parallels in the character of Charlotte Waterford.